There are two great cinematic jokes in the new film Kill Your Darlings, two sly references to the dilemma of self-consciousness that this movie about the Beat Generation struggles to overcome. First, it must overcome the suffocating celebrity of Daniel Radcliffe, who plays the poet Allen Ginsberg, and the movie smartly tackles the “hey, there’s Harry Potter” problem right away. The movie opens with teenage Allen cleaning up his parents’ house, jamming to a song on the Victrola, and dancing merrily with a broom. Kill Your Darlings toys with its literary legacy as well. As several people pitch in to help a mischievous and manipulative Columbia University student named Lucien Carr write a paper about the historian Oswald Spengler, we see a typewriter tapping out immortal words that remind us of another recent Hollywood film: “On … the …”. But then instead of “On The Road”, the words turn out to be “On the Decline of the West”. Directed by John Krokidas and written by Austin Bunn, Kill Your Darlings is a clever, knowing film about the early exploits of Allen Ginsberg, Jack Kerouac and William S. Burroughs. It’s lively in the same way that Baz Lurhmann’s Great Gatsby was (though, of course, it’s nowhere near as bombastic), and it whips up a cinematic frenzy of literary inspiration that goes even deeper than Walter Salles’s On The Road or James Franco’s Howl into the ecstatic and Dionsyian mission of the early Beats. The movie has frustrating flaws, but perhaps succeeds mainly through the dedication of the excellent cast, which includes Jennifer Jason Leigh as Ginsberg’s schizophrenic mother, Dane DeHaan as Lucien Carr and Ben Foster as William S. Burroughs. Daniel Radcliffe’s Allen Ginsberg also works very well, which goes to show that Daniel Radcliffe is good at playing divinely inspired fervent innocents. I like Radcliffe’s earnest, heartfelt Ginsberg — even though I don’t think he quite captures the weird, powerful presence the famous poet always had (James Franco and other recent Allen Ginsbergs have also failed to capture his strong vibe). Having met and talked to Allen several times, I’ve sometimes struggled to describe his presence and have ended up resorting to the word “froggy”. Allen Ginsberg had a croaking voice, bulging, peeking eyes, a jumpy, crouched stance. His improbable demeanor added to the considerable urgency of his presence. I wish some actor could capture his heavy presence, his odd charisma, but if Allen Ginsberg’s spirit animal is a frog, Daniel Radcliffe’s in this movie turns out to be more like a chameleon or a cute lizard. It’s not the same thing. The movie is about the early Beats as students in upper Manhattan, and about a murder (Lucien Carr stabbed and drowned an ex-lover) that shook all their friendships and left them all feeling guilty of one crime or another. The murder is less interesting than the blooming friendships, though some long scenes of campus pranks become frivolous and phony (a long sequence involving a library break-in descends to cartoonish storytelling, for no good payoff). At a couple of bad moments, the movie feels like a “Little Archies” of the Beat Generation — familiar faces, but younger and chubbier, with bigger smiles. But this movie isn’t afraid to be cute, and its brashness is appealing. Kill Your Darlings may someday become a popular midnight double feature with Little Darlings, which presented a parallel vision of teenage girls flirting with danger. There is much excitement to this movie, but little suspense or revelation. Kill Your Darlings is certainly not a mystery or a thriller. It’s a good college drama like A Separate Peace or Hitchcock’s Rope, or Dead Poets Society or History Boys — like the amazing movie of Donna Tartt’s Secret History which never has been made but hopefully someday will. The movie stretches too many historical facts in order to wrap up too many psychological angles too neatly. But some of the twists manage to score. 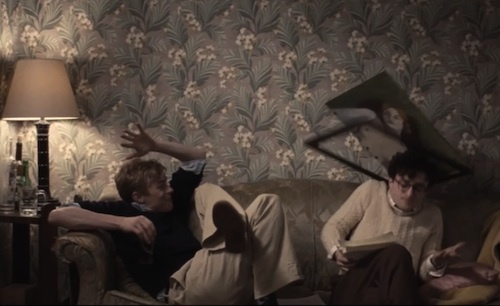 Unlike Marc Olmstead in Sensitive Skin, I don’t mind that Kill Your Darlings shows William S. Burroughs and Lucien Carr going wild with cut-ups on a wall years before Burroughs supposedly discovered the cut-up method with Brion Gysin. I like the idea that the idea might have echoed in his head for years. Any historical movie has the right to cut a few facts up in the name of good cinema. But I do agree with Brian Hassett that the actor who played young Jack Kerouac fails to do much with the role, and that it makes no sense for young Lucien Carr to say “I’ll go to jail for the rest of my life” when in the real life story Jack Kerouac was known to have said “You’ll get the hot seat for this”. Why substitute a boring line for a good one, especially if the good line was historically accurate? Well — maybe just to piss off cranky old Beats like me. That’s fresh.